Osteopathy is one of the main forms of Manual Therapy Treatment for joints, muscles and ligaments. Osteopathy is one of the main forms of Manual Therapy treatment that works with the musculo-skeletal system (e.g. joints, muscles, ligaments, tendons and connective tissue). Osteopaths work in a holistic approach towards patient care. They look at the body as a whole unit, rather than just focusing on the problem area. This helps to aid a more complete return to normal function or sport. There is no ‘one size fits all’ and nobody’s body is a walking anatomy textbook. Treatment for one person with low back pain may be very different to treatment of someone else with a similar pain. Osteopaths look at a range of lifestyle factors. This includes general medical health, sports activities, nutrition and other factors. They also consider biomechanical factors when treating and managing their patients. Tightness in one part of the body can cause tightness elsewhere, and the body will adapt and compensate accordingly. As a result this can lead to inflammation, stiffness and pain. Osteopathic treatment helps to release mechanical and emotional stress and tightness held in the body because it improves mobility in the joints, flexibility and the tone of muscles. Osteopathy is one of only two Complementary and Alternative Medicines (CAMs) that are regulated under UK law. This regulation works in much the same way as regulation for medical doctors. 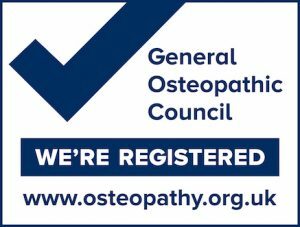 All osteopaths are required to be registered with the General Osteopathic Council (GOsC).